Facetite is a minimally invasive office treatment that usually takes no more than 30-45 minutes. There is minimal recovery and patients are usually able to return to work the next day. Improvement is immediate but will continue to progress for 3-6 months as more collagen and elastin are produced in response to the treatment. Facetite is usually performed under local anesthesia, and occasionally this is supplemented with light oral sedation. When combined with other procedures, it may also be done under general anesthesia or in the recovery area after your surgery. "Five Stars - I am very pleased with my Facetite procedure. I would highly recommend Dr. Soto." "I am very pleased with my Facetite procedure. I would highly recommend Dr. Soto." Before your Facetite procedure, Dr. Soto will mark the area(s) to be treated, and you will be photographed. Once the anesthetic is administered, awake patients usually feel only a bit of warmth that is not unpleasant. Once the treatment has been completed, your skin will be cleansed and you will be placed in the appropriate support garment, to be worn 24 hours a day for the first few days (Dr. Soto will advise you based on your treatment and tissue composition). Most patients experience minimal swelling, minimal to no bruising, and mild tenderness in the treated areas for a few days to a week. Return to normal social activities is possible for most patients after 48 hours. You will see improvement almost immediately- but because the primary benefit of the treatment is the longer term increase in collagen and elastin production, your improvement and tightening will continue to improve and progress over the next 3-6 months. Treatment costs will vary according to total treatment time, the type of anesthesia used, and whether or not the procedure is combined with other treatments. 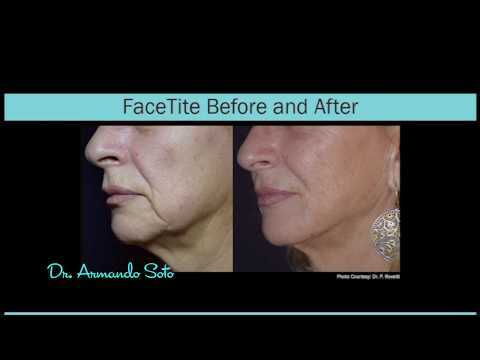 In some areas and for some patients, Facetite does represent an excellent alternative to surgery in the sense that these carefully selected patients will achieve an improvement comparable to what they could expect through surgery- but without having surgery, without long scars, and with much less expense. For other patients, Facetite will represent a compromise- meaning that the improvement may not be quite as dramatic or smooth as they could have achieved through surgery, but because it is much less expensive and offers the significant advantages of no scars and minimal recovery, is preferable for them. Dr. Soto performs all Facetite procedures personally. Absolutely. To best understand what to expect and whether the combination you are interested in is possible for you, visit Dr. Soto for a consultation.